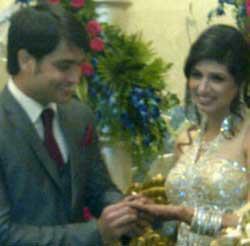 After getting engaged last year, Vivian Dsena and Vahbbiz Dorabjee enjoyed a wonderful courtship period which strengthened their relation even further. The couple has now decided to take this relationship a step mbele and enter a beautiful married life. To find out zaidi about the same we contacted Vahbbiz who confirmed the news saying, "Yes, finally out marriage tarehe is decided . We are getting married on 7th January 2013." While other actors on TV are content playing lover boy au somebody's husband, Vivian Dsena has carved a niche for himself kwa playing hatke roles. After all, not every actor gets to play a vampire on the small screen! After becoming the nation's moyo throb with his 'bloodthirsty' role, he is ready to take it up a notch kwa playing superstar RK in his new onyesha 'Madhubala-Ek Ishq Ek Junoon'. Though he is pushing the envelope when it comes to roles, he is not that adventurous when it comes to other things. I heard that PKYEK seasen-2 is coming between 18 march-23 march 2112 .I visit on sukriti's real Facebook (with her proof)she alisema that k pkyek-2 changed its name- FANNA and misha(priya wal) is not in the serial.she miss her.Pkyek-2(fanna)'s set is very fabulas she like it so much! On shooting's first siku vahbiz come with vivian to support him. Saurabh Tewari's Nautanki Films'Shikhar is undoubtedly the inayofuata much awaited onyesha on Colors. Several big names had reportedly been approached to be part of the onyesha and considering that the concept bordered around kuvuka, msalaba border romance, the hunt for the lead faces was magnanimous. We hear that many maarufu hunks of televisheni were approached for the male lead role and the onyesha has apparently shortlisted two names for the leads. The pair, who has been very open about their relationship, kept the engagement under wraps. They did not call the media au share any details about the special occasion. On which siku Vivu and vahbi engaged?